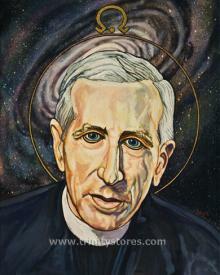 A Jesuit priest, philosopher and scientist (paleontologist), he was often in trouble with the church he served. However, writer Thomas Berry stated, "I fully expect that in the next millennium Teilhard will be generally regarded as the fourth major thinker of the Western Christian tradition." Teilhard focused on the unfolding of the universe as a physical and spiritual evolution. As author Brian Swimme writes, you could simply summarize his thought as, "...the universe begins with matter, develops into life, develops into thought [and] develops into God." He goes on to state that Teilhard's idea of the "omega point" meant a universe that becomes God, as we evolve to this as a point in the future, it exerts a force on our present. All creation as part of the same process, the universe becomes God's body. Teilhard states, "By means of all created things, without exception, the divine assails us, penetrates us and moulds us. We image (the divine) as distant and inaccessible, whereas we live steeped in its burning layers." May the gift of the universe teach and lead us.